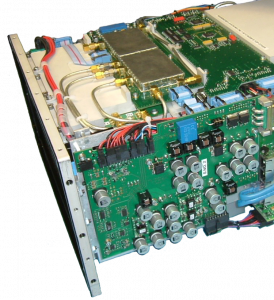 This Wideband Code Division Multiple Access (WCDMA) product was designed for a client who supplies mobile base station products world wide. Design was for a low volume high value market. Mechanical design for this high tech equipment was developed to a demanding specification in close collaboration with the client’s electronics engineers. It was a complex packaging exercise to fit a lot of high powered electronics with sufficient cooling into the smallest and lightest product possible. 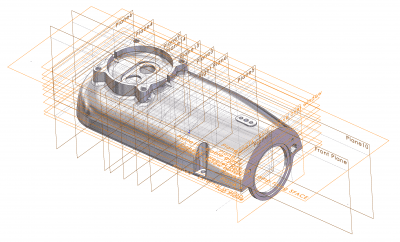 A design process that was greatly aided by 3D CAD (Computer Aided Design), simulation and an array of checking and analysis tools to check parameters such as total product weight, interference checking, complex 3D cable routing, reviewing with the customer and clearly showing changes in 3D for suppliers. Construction was based on a central high performance yet light weight heatsink. Everything was attached to this like a skeleton during assembly. Included in this were several large complex CNC machined components forming a nested RF enclosure sandwich to minimise space between electronics layers. CNC machined front and rear panels provided two robust ends with a front high quality polycarbonate decal giving the aesthetic human interface. Final exterior protection was given by sheetmetal covers on the remaining four sides. This allowed easy access to the whole unit by removing two covers. 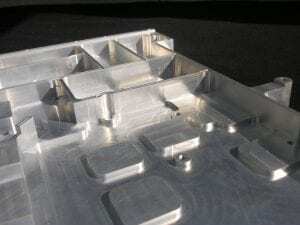 Significant development went into the heatsink design through a series of prototypes, the first being a large SLS (Selective Laser Sintered) 3D printed model for design verification. Later prototypes used production manufacturing processes as the bonded corrugated foil and separators could not easily be simulated and production thermal performance had to be validated. This heatsink technology is also used in Formula 1 racing cars and the aviation industry. 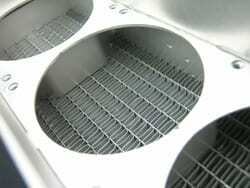 Throughout, a very close working relationship was established with the supplier to develop the heatsink for manufacture. 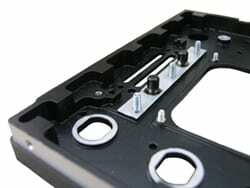 The product became a leader in the company’s product range and is in use around the world.